It doesn’t matter if you’re natural, locked or relaxed, if you’re like most women and have taken an active interest in your hair, we can bet that you have come across a myriad of terms and abbreviations that left you thinking “Huh?”. Whether you’ve been lurking in natural hair groups on Facebook, following your favourite hair bloggers or watching YouTube tutorials, the ever-growing hair jargon is enough to intimidate even the most determined newbie. So, we decided to put it all in black and white and make life a little easier for you. We took our time and compiled a list of the most widely used terms in relation to textured hair. So sit back, take a deep breath and have a scroll through this hair glossary and we’ll have you talking (and typing) like the most seasoned pro in minutes. Accordion Technique (aka Scrunching): This is a low maintenance Wash and Go technique that forms well-defined curls. Please note it can be very messy, so we suggest doing this in the shower for easier clean-up. Wash and condition your hair to your preferences. While hair is soaking wet, add a styling cream or a curl definition gel. Lower wet hair into an open palm and gently scrunch towards the scalp until you’re happy with the results. That’s it. Your hair will air dry as you go about your day! ACV (Apple Cider Vinegar): Yes, the same apple cider vinegar that’s probably sitting in your pantry at this very moment. ACV is normally used in a diluted form as a final rinse after cleansing & conditioning. It works well to seal and tighten the cuticle layer for improved shine. Afrofinity Tip: Store your ACV in the fridge for 30 mins prior to your rinse, this greatly improves shine, and decreases frizz. Afro Puff: A hairstyle whereby the hair is pulled back at the crown, sides and nape, using headbands, hair pins, scarves, etc. The remaining hair extends freely. Baggy(ing): The practice of covering the hair overnight with a shower cap (or cling film) for the purpose of increasing moisture. This is thought to help reduce damage, split ends, and extreme dryness. 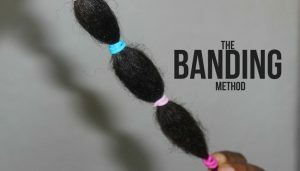 Banding: The process of stretching hair by using stretchy bands (kindly avoid rubber bands). To band your hair, section it off and use a stretchy band to tie each section close to the scalp. Continue down along the hair shaft making sure the spread the bands out in order to let the hair breathe. This is a good way to stretch hair without heat. Bantu Knots: A hairstyle created by parting hair in small-to-medium sections (depending on your preference), and then twisting the sections in one direction until they wrap into neat knots – or little buns. If your hair is long enough, the knots will wrap around themselves and be secure. If not, you can secure the knots to your scalp hair pins. For great curl definition. Afrofinity Tip: For amazing results, add styling products to slightly damp or dry hair – never to wet hair. Bantu Knot Out: A gorgeous style, with bomb curls or waves (depending on the size of the knot) formed by releasing Bantu Knots after they are completely dry. BC (Big Chop): The act of cutting off all chemically processed sections of the hair, leaving only natural-textured new growth. BNC (Braid & Curl): The general term for styles created by plaiting or braiding the hair while damp. Twist outs, flat twists, 3 strand twists are all examples of BNC. After the hair is dry, the braids are removed to reveal a bouncy and curly hair texture. Clarifying: The process of removing product build-up i.e. oils, styling products, and/or minerals from the hair. This usually requires special shampoos (look out for clarifying shampoos) or baking soda rinses if you prefer to DIY. Cleansing: A term used to refer to the washing of hair with a Sulfate-free shampoo or a co-wash.
Coiling (aka Shingling): A hairstyle achieved by taking small sections of very damp hair and smoothing, while rotating the sections, one-by-one, from root to tip – essentially coiling the hair around your finger/comb. Typically, a curling gel is applied prior to coiling for longer-lasting hold and shine. Cones (Silicone): Ever wondered what make most serums give your hair that amazing shine? That, our friends, is the wonder of silicones. Silicones create a water-resistant barrier around the hair shaft and seal the cuticle layer, therefore enhancing shine while reducing frizz. 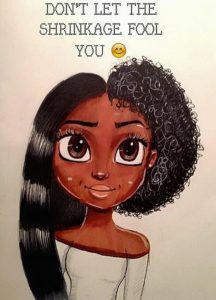 Many women with natural hair are recently rejecting products that contain silicones due to the belief that they create build-up and prevent the hair from absorbing moisture. Co-wash: The practice of cleansing the hair using a conditioner in place of a typical shampoo. Shampoos tend to strip the hair of natural oils whereas co-washing helps hair retain moisture. Preferred by many Naturalistas (and now adopted by relaxed/tex-laxed women) as the predominant method of cleansing with shampoos being used mostly for clarifying purposes. DC: Deep conditioner aka treatment. An intense moisturizing, strengthening and/or repair product that is applied right after cleansing, and often allowed to penetrate for up to an hour with the use of a mild heat source – or for a few hours without heat. Should be done 1-2 times/month. Dusting: Meticulous trimming of the hair, typically 1cm or less. The amount of hair trimmed is usually so small that it appears as dust. If done regularly, this will greatly reduce your split ends. EO (Essential Oils): Aromatic oils are extracted from natural sources such as; flowers, fruits, leaves, or trees, and maintain the odours and tastes, and as a result, the essence of the plants from which they are extracted. Among many applications, they are sometimes used to nourish the hair and scalp. EVCO: Extra Virgin Coconut Oil: A favourite in the hair community, it is one of the few oils proven to penetrate the skin and hair. Used as a hair care product for shine and to seal in moisture. Loved for its emollient and shine-producing properties. Flat Twists: A styling technique whereby the hair is twisted flat to the scalp in cornrow fashion, but with 2 strands instead of 3. Fluffing: Ah! The technique that inspires volume envy! Use of fingers, afro comb or a pick to add volume and shape to natural hair by fluffing from the root. This is the technique that makes ALL the difference. Frohawk: A style where the sides of an afro are flattened to the scalp, either by braiding, gelling or pinning. The hair in the middle is left high and free, in the shape of the distinctive Mohawk. A classification system created by hairstylist Andre Walker. Hair typing is essentially the amount of texture hair has. Naturally straight hair is Type 1, loose-wavy hair is type 2, curly hair is type 3 and coily hair is type 4. In the case of types 3 and 4, the sub-classifications from a – c, are based upon the diameter of the curl or coil. For instance, a type 3a curl may have the diameter of a KES 20 coin, a 3b, like a KES 10 coin and a 3c like a KES 5 coin. Type 4, which is the most common for people of African descent, ranges from the diameter of a pencil eraser (4a), to the diameter of a pen spring or smaller. In some cases, hair may even have an extremely tight Z pattern and no coil at all. Henna: A natural plant-derived powder used to condition and lightly colour hair. Henna, when mixed with water to make a paste, is applied to hair, processed and rinsed out. Please note that natural henna has a reddish brown tint. Any other henna (black/indigo etc.) have chemicals added. HG (Holy Grail): Your personal favourite products. HG refers to products that one has tried, achieved amazing results with and remains loyal to. 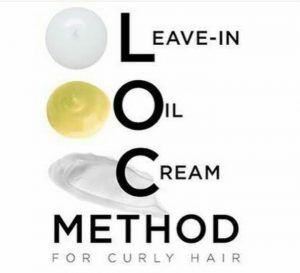 LOC/LCO Method: Liquid-Oil-Cream method, though some prefer to use the Liquid-Cream-Oil Method. These methods are used after cleansing to seal in as much moisture to the hair as possible. Liquid refers to a leave in conditioner used to moisturize the hair. Oil is any natural oil/oil blend used to penetrate the hair shaft and seal in moisture. Cream is used to prevent moisture loss and smooth down the hair cuticle. Locks/Locs: A hairstyle whereby sections of hair are twisted and over time, the strands become permanently secured. As locks/locs grow, they can become quite long since they require minimum manipulation. Naturalista: A woman who wears her hair in it’s original texture – with no chemical manipulation. 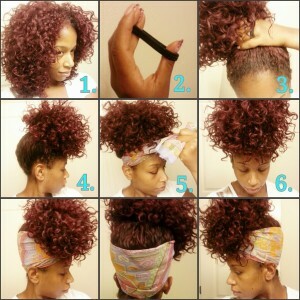 Pineappleing: Ever wonder how seasoned naturals maintain their curls for up to a week? Pineappleing is the technique of pulling hair into a loose pony tail at the top of the head, therefore resembling a pineapple. This is a great way to retain curls/waves overnight – just be sure to sleep on a satin pillowcase. In the morning, the bands are removed and the sections are gently shaken or fluffed. PJ (Product Junkie): A person who buys a variety of different products and brands in the quest of finding the “perfect” ones for her hair. Plopping: We all know drying hair with a towel is too manipulative. Plopping is the act of lowering a loosely wrapped t-shirt (or other soft material) while bending from the waist. Do this after a wash/co-wash, and it will absorb excess moisture from your hair. Pre-Poo: Oils, conditioners, and other substances, or a mixture of all applied to the hair prior to shampooing to enhance moisturizing and conditioning during washing. Pre-pooing is an amazing way to keep your hair soft and supple throughout wash day. PS or Protective Styling: Any hairstyle that helps protect the ends of hair from dehydration and damage, by eliminating the need for combing, brushing, and heat styling. PS also helps shield the hair against environmental factors, (i.e. sun, heat, cold, wind). Some examples are buns, braids, twists, ponytails and various head wraps. Sealing: Applying a product or single ingredient, usually a natural oil or butter, to the hair to help lock in moisture. May be applied along the entire hair strand or just to the ends, following cleansing. Second Day Hair: The state of one’s natural hair on the day after it is cleansed, conditioned and styled. Some women swear by 2nd-day hair, saying that hair is fuller, freer and more natural looking. For others, it’s a negative look, referring to frizz, loss of definition, shine or overall shape. Shingling: Almost similar to Coiling. A form of Wash & Go whereby a styling cream/gel is liberally applied in sections to clean, wet hair. As the styler is applied to each section of hair, the section is then smoothed between the thumb and forefinger, in a downward motion all the way to the ends. The smoothing action, in combination with the styling product immediately makes the curl pattern evident. Hair is then either air-dried or dried under a hood dryer. Once dry, the hair is fluffed to style. Shrinkage: The greatest hair illusion ever. Shrinkage refers to the reduction of the visual length of hair. It is a process that occurs as wet hair dries and re-coils into its natural texture pattern making even the longest of hair appear short. Slip: A state produced by a product where fingers and/or combs are able to easily and smoothly glide along the hair-shaft. In a bid to enhance manageability, it is desirable that hair care products such as co-washes, leave-in conditioners, and deep conditioners provide this attribute, without leaving behind any residue. SLS or Sulfates (Sodium Lauryl Sulfate): A synthetic detergent associated with hair dehydration and colour fading. Commonly found in conventional shampoos. Split Ends: Frayed, dull and damaged hair ends. Trim regularly to maintain hair that pops and retains length! Stretch: This is a technique to prevent hair shrinkage which is characteristic textured hair. Through various stretching techniques – such as blow drying, banding, or pineappling – more of the hair’s actual length is visible in the completed style. Some products also inhibit shrinkage, thereby helping to stretch the hair. Tex-laxing: The process of applying a chemical relaxer for a minimal period of time (5-8 minutes) to loosen the curl pattern while still maintaining texture and volume. While the end result is usually quite similar, tex-laxing differs from texturizing due to the different products used. Texturizer: A chemical process used to partially loosen the natural curl pattern of extremely textured hair. Provides greater length and manageability. 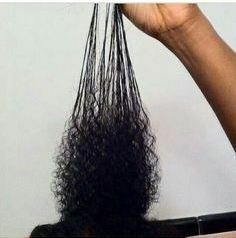 Texturizers are a milder form of relaxers. Transitioning: This is the process of shifting from chemically processed to natural hair. One’s natural hair is allowed to grow, while the chemically-treated sections are trimmed off in stages. The ultimate goal is to have a full head of natural hair, without cutting all the processed hair (i.e. the Big Chop). The length is maintained by gradually eliminating the processed portions. Transitioning isn’t easy as it involves managing 2 different textures. A good strategy is to wear curly styles (i.e., flexi-rod sets, and twist outs) as the new hair grows to minimize the texture differences. Twist Out: A hairstyle achieved by gently separating two strand twists. After the hair is dry, the twists are gently separated, fluffed and styled. Two-Strand Twists: A hairstyle created by twisting small 2 strand sections of the hair and winding them upon each other. For great results, this should be done while hair is damp. Hair is then allowed to air-dry or using a hood dryer. The bottom half-inch or so of each twist is left loose and wound around the index finger into a coil. 2-Strand Twists can be worn as is, or the twists can be gently separated when dry (Twist-Out) for a look that’s full of volume but still maintains well-defined curls. Wash & Go aka W&G or WnG: This is the fastest and easiest styling technique where a style is achieved without excessive manipulation through knotting, twisting, braiding, etc. Hair is first cleansed and conditioned. Curls are then defined with gel or a styling cream and allowed to air dry or using the diffuser attachment on a blow dryer.